You'll be £10.50 closer to your next £10.00 credit when you purchase Tracing Your Seafaring Ancestors. What's this? Order within the next 6 hours, 48 minutes to get your order processed the next working day! Photographs of your seafaring ancestors may tell you more about their lives than you realize, and Simon Wills’s helpful and practical guide shows you how to identify and interpret the evidence caught on camera. Since maritime roles have been so vital to Britain’s prosperity and military might, they are among the commonest professions depicted in photographs of our ancestors, and his handbook is the ideal introduction to them. Maybe your ancestor was a seaman in the Royal Navy, a ship’s captain, a steward on an ocean liner, or an officer in the naval reserves? This book shows you how to spot photographic clues to an individual’s career. Whether your ancestor served in the merchant navy or the Royal Navy or in another seagoing role such as a fisherman, a lifeboatman, or even a ship’s passenger, Simon Wills’s book will be your guide. Tracing one’s ancestors is certainly a pastime gaining in popularity. And it’s not just paper records that are helping us build up the family tree. Photographs of seafaring ancestors can tell a great deal about their lives, and Simon Wills’s helpful and practical guide shows how to identify evidence caught on camera and interpret the photographic clues to an individual’s career. Who knows – do you have a Jellicoe or salty able seaman in your family’s past? As would be expected, the book is filled with interesting photographs that are used as an informative example, where caps, badges, buttons, medals, uniform and the backdrop are to be studied, an explanation is given and then after the reader is provided with web site links with which to seek further knowledge. For us maritime enthusiasts, a modestly priced diverting publication. As a retired mariner, amateur genealogist and photographer, I was delighted to have the opportunity to review this book. Dr Willis has brought to life an important and interesting aspect of UK family research showing us how to look in detail for clues to interpret old photographs of salty ancestors. A useful and practical guide for learning more about ancestors who were at sea from photographs as well as providing an insight into British maritime history. Although a huge subject, Mr. Wills has provided an excellent guide to this, and also to helping anyone understand much of the information that can be gathered from old photographs. If you have photographs of sea going ancestors this book would be invaluable for ongoing research and further study; it is also a jolly good read! 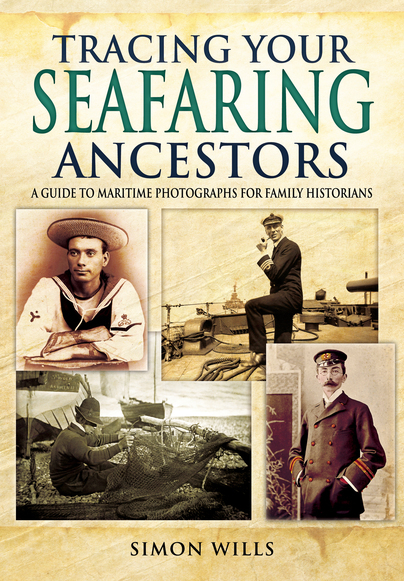 A well-illustrated new book has been published as a guide to help family historians and other researches find out more about maritime photographs. I found this book absolutely fascinating and learned things I didn't know I needed to know. It is packed with photographs and examples, so it is visually a treat. I for one will be keeping a copy of this permanently on my desk as a reference guide. An absolute must for interpreting that maritime family album. There are some great tips and clues: from questions to ask yourself as you begin analysing your photographs, and the difference between the Royal and Merchant Navies, right down to what cuff stripes can tell you. Whether 'your' seafarer was in one of the naval services, was a fisherman, a Royal Marine or even a ship's passenger, this clear and easy-to-read guide will help you learn more about their lives. It is the subtitle - 'A Guide to Maritime Photographs for Family Historians' - that really tells you what this book is about. As well as providing background information on the development of uniforms he also suggests various avenues for further research. This volume is a comprehensive guide to interpreting photographs of seafaring ancestors from 1850-1950. It is aimed at helping you identify your ancestor's roles at sea, and it explains their ranks and medals and will provide the researcher with tips for investigating careers. The book is a fascinating insight into Britain's maritime history, so if like me, you have sea salt in your blood, then it is worth taking a look. I am not a Naval expert by any stretch of the imagination, but this book could easily help me become one. There is a lot of extremely useful information contained within these pages, and not just information regarding the identification of naval photographs. The scope of the book, considering its modest 170-odd pages, is wide and yet it seems to cover all the bases. I particularly like the way in which photographs have been overlaid with specific detail when the author is expanding on cuff stripes, shoulder straps or branch badges, and he is to be congratulated on putting together a first class guide to seafaring ancestors whether they be Merchant Navy, Royal Navy or other seafarers in general. This is going to be an extremely useful resource and there is obvious cross-over with the army with detail on Royal Marines and Royal Naval Division. 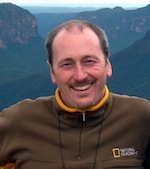 Dr Simon Wills is a maritime genealogist, researcher and author, who writes for many genealogy and history magazines including Who Do You Think You Are?, Family Tree, Discover Your History, and Your Family Tree. He has over 25 years' experience researching maritime history and also works part-time as an information adviser to the NHS and other healthcare organisations.